Here we are bringing you a joyful bunch of playful kid's room décor schemes, including a few inspirational shared kids room designs, full of colorful accent ideas, great storage furniture and fun twists. This shared kids room design begins with a black and white base in the form of a huge geometric rug and forest themed wallpaper. 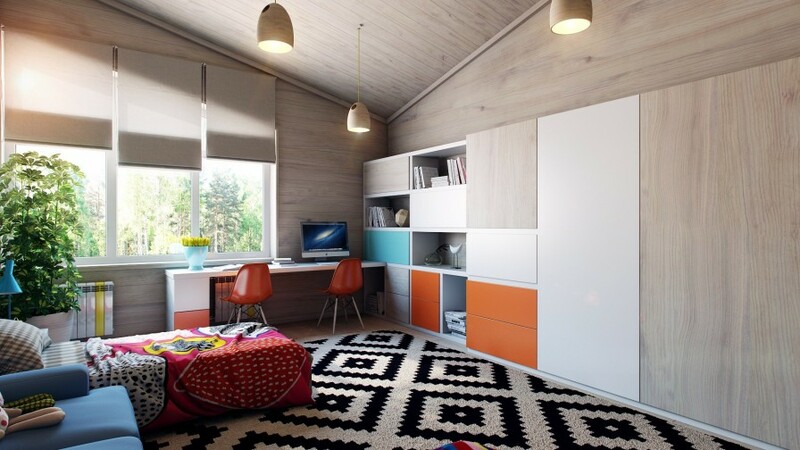 On top of the monochromatic base scheme, small bursts of glorious color cover the two kids beds and matching desk chairs. 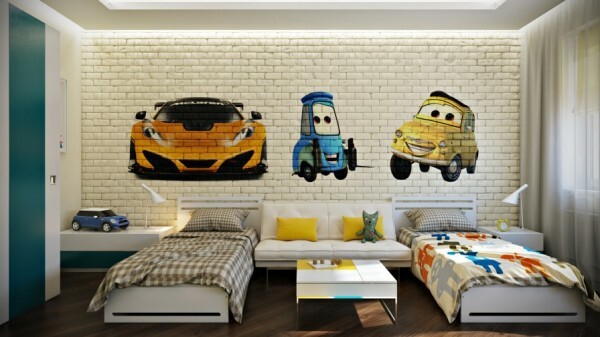 The twin beds are connected by a shared couch that provides a perfect perching place for the siblings soft toy collection. 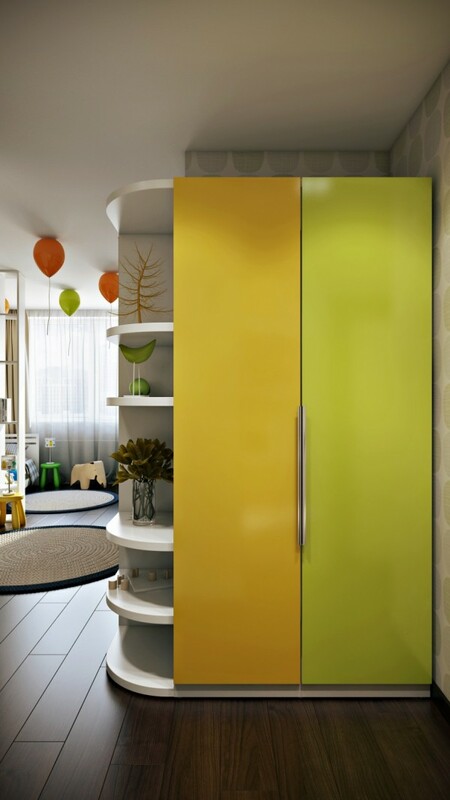 The opposite wall holds a bank of storage options that have been picked out in contrasting colors too. A wooden ceiling calms the whole scheme down with a cool earthy tone. 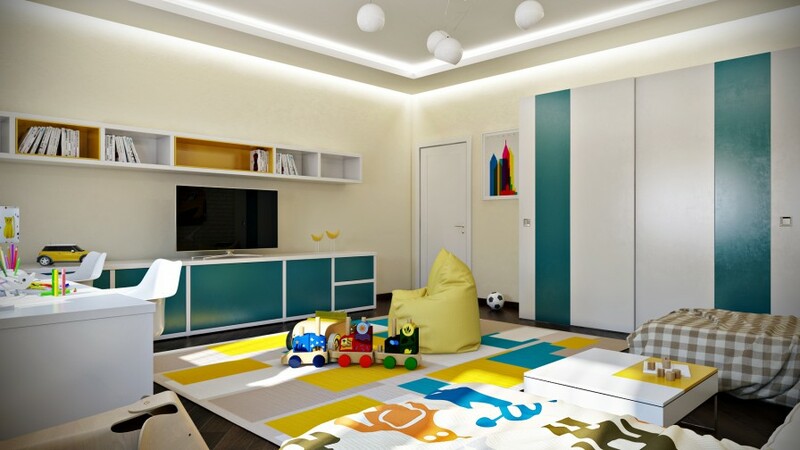 In this space, aqua and yellow make a fresh combination; even the ceiling has been treated to a swathe of aqua blue over its entirety. 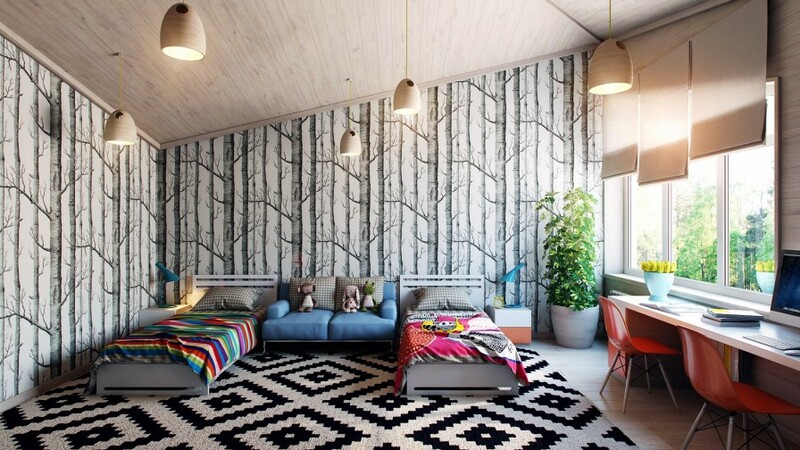 A fun print wallpaper, in pale tones, adds interest to the look of the room without swamping it. 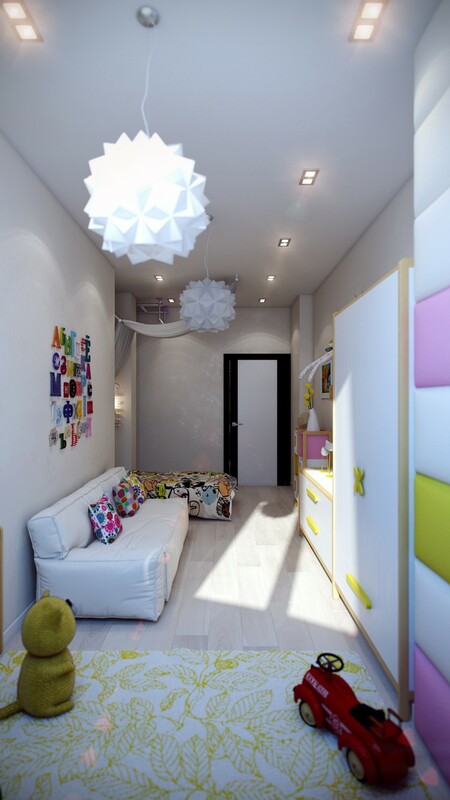 Multiple chrome-ball pendant lights decorate the space. Against the same subtle wallpaper print, several works of bold graphic art have been hung to liven up this shared children’s room. A tall bookcase with open sides has been installed to act as a room divider, instead of resorting to anything too solid or unsociable. 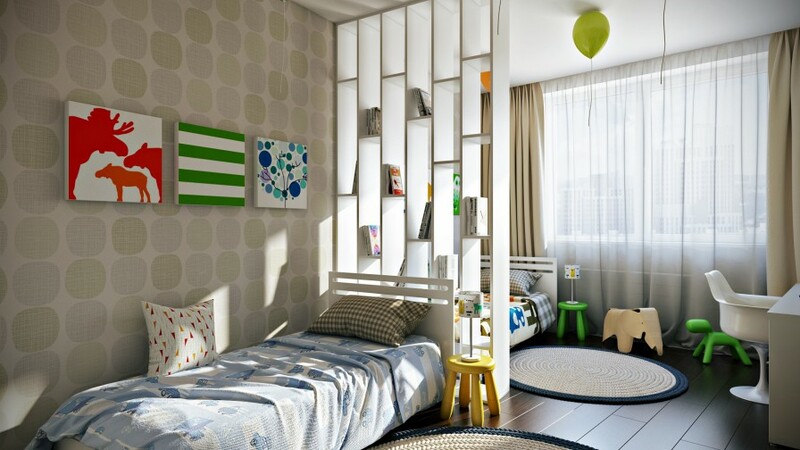 The shelving is also a very practical solution to house a shared book library or accumulated clutter–or even to keep school study books handy for bedtime reading! 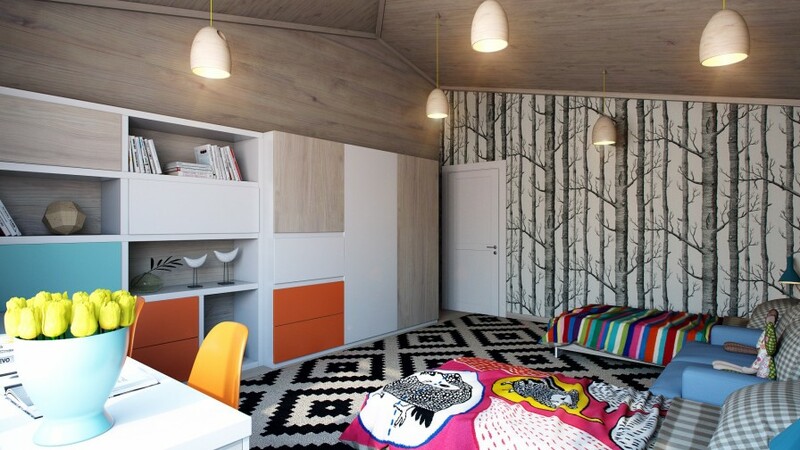 The open sided unit also allows daylight from the window to flow through to the second sleep space, as well as conversation. 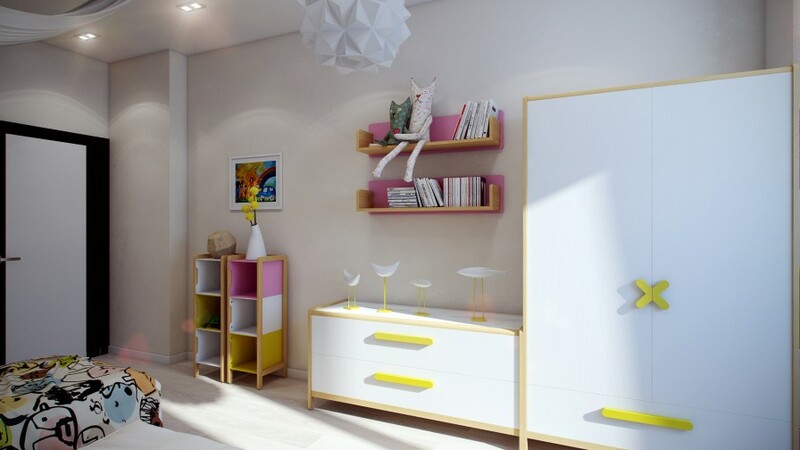 More bright shelving decorates the opposite wall. The Saarinen Tulip chair functions as the kid’s chair here. 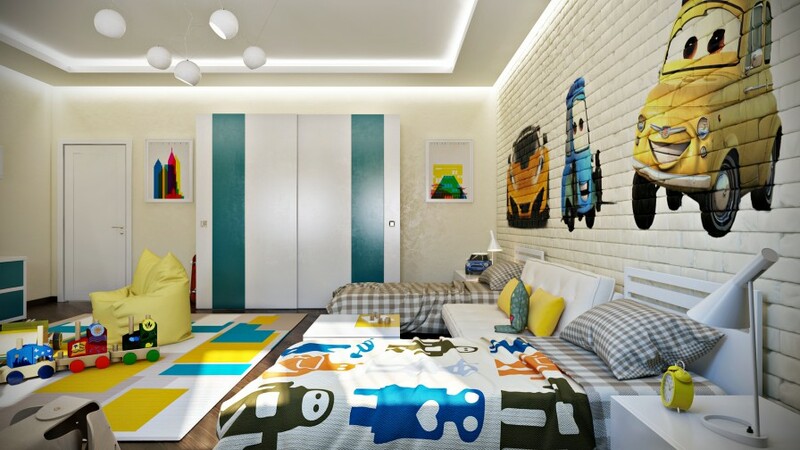 A fun color block rug livens up a central bedroom floor area. 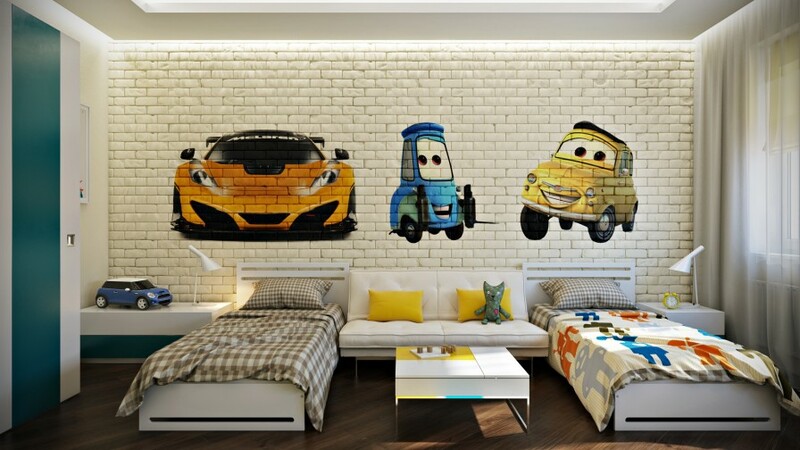 A wall mural of your child’s favorite animated movie characters could be the key to bringing their bedroom scheme to life, and in a shared bedroom design like this it could also be the key to making each child feel that they have placed their own stamp on the place. 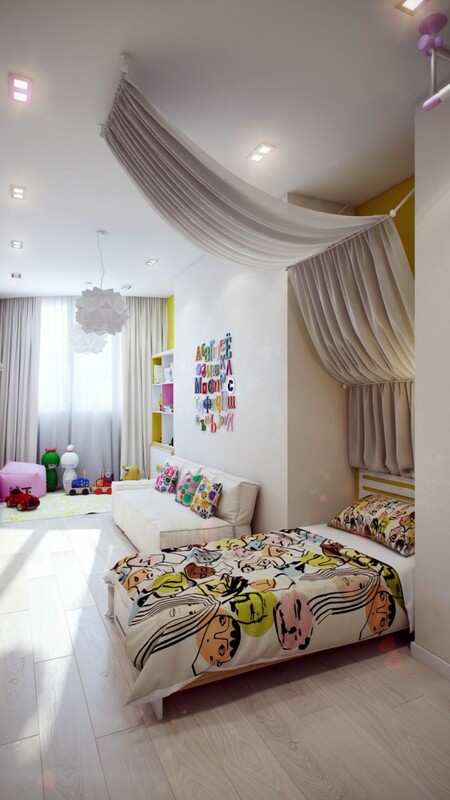 In this room, the younger child’s bed covers have been made more fun with the addition of a funky throw. 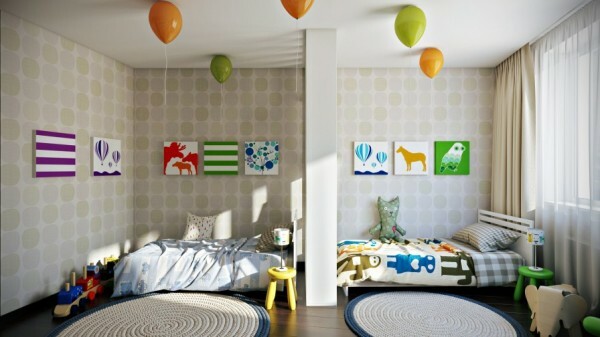 Color doesn’t have to overwhelm a child’s room, small pops can make a beautiful crisp impact.